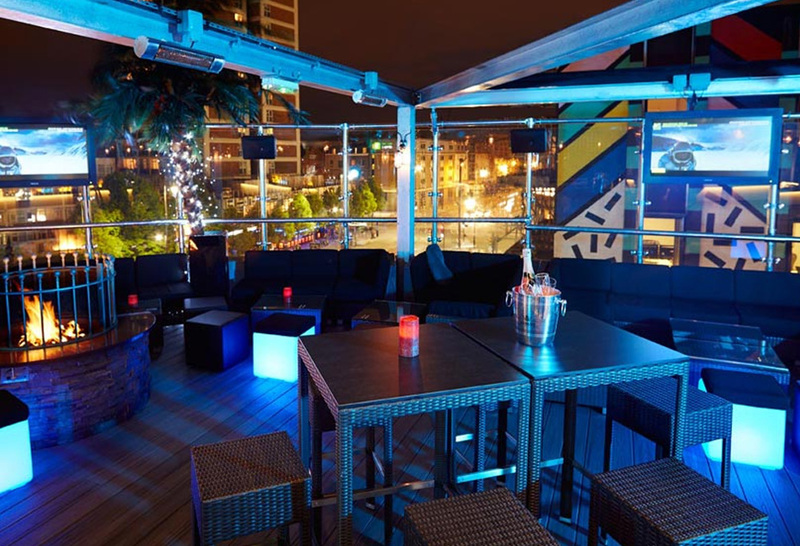 Enjoy the best rooftop terrace in Shoreditch no matter what the weather! Our rooftop terrace bar is open year-round and features a retractable canopy that makes it weatherproof in the summer and warm and cosy in the winter. Fully-heated and with a firepit, enjoy a tropical paradise in the summer and cosy sanctuary in the winter. When the weather’s nice, nothing beats sharing a nice bottle of bubbly or a round of your favourite cocktails on a rooftop terrace. With the breeze in your hair, the sun and blue sky above, and the bustling streets of East London’s Shoreditch below, it’s no wonder the Golden Bee’s rooftop bar has become everybody’s favourite! Even on a cloudy day, there’s a certain magic about taking in a nice view from a few storeys above the world we normally live in. But you know how London weather can be—one minute the sun is shining and the next it’s a downpour. The good news is that at the Golden Bee rooftop terrace, we’ve got you covered—literally! With a giant canopy that completely covers and weatherproofs the terrace, our rooftop bar turns into a cosy sanctuary where you can enjoy the serenity of a rainy day feeling like you’re floating on air. Notice we didn’t say “in the summer”—that’s because our rooftop terrace bar is open year-round. In the summer, we decorate the area to look like an exotic tropical destination, but once the chill sets in, the canopy comes down permanently and the heaters and blankets come out, providing a fully-heated, cosy winter paradise. We even have a fire pit that’s perfect for sitting around and enjoying our seasonal drinks offerings and warming winter cocktails—especially our signature homemade mulled wine! As a matter of fact, we’re one of the few rooftop terrace bars that’s open year-round. What better way to beat those winter blues than to gather with friends or colleagues for happy hour in a warm and cosy rooftop terrace? The autumn and winter is an especially busy time for special occasions—from Halloween soirees to festive birthday gatherings to Christmas parties—and what better way to add that special something to your event than by holding it on our fully-heated rooftop terrace? Come in from the cold and warm up with your favourite tipple as you take in the view of one of London’s most unique neighbourhoods.